South Plains College’s admissions program is based on an open door philosophy which accepts all students for enrollment regardless of race, color, national origin, religion, gender, disability or age. To be eligible for admission to SPC, you must have graduated or received a diploma from an accredited high school, have successfully completed a nontraditional secondary educational program, including home school, have successfully completed the General Education Development (GED) Test, or be admitted by individual approval. Students wishing to transfer to South Plains College from another college or university will be considered for admission based on their previous college record. International students seeking admission should contact the Registrar directly for specific application information and forms. The Dean of Admissions and Records is responsible for administering the admissions policies and procedures of the college. Questions pertaining to admission to South Plains College should be directed to the Admissions and Records Office. In all cases, students seeking admission to South Plains College should follow these steps in the process. New and transfer students must submit an ApplyTexas Application for Admission at www.applytexas.org. An official transcript of the student’s academic record in high school or the record at each college attended since leaving high school must be filed with the Admissions and Records Office. The applicant is responsible for having these records forwarded to the Admissions and Records office. Transcripts should be sent immediately following the close of the last semester of attendance in high school or other college. Students who have successfully completed a non-traditional secondary educational program that meets all Texas Education Agency (TEA) standards must provide an official transcript, along with a notarized statement indicating the student has completed all high school requirements. Students applying for scholarships must provide ACT or SAT scores in order to meet scholarship eligibility requirements. Students who are entering college for the first time and who are not waived from Texas Success Initiative (TSI) are required to take the TSI Assessment test prior to registering for classes. The student’s placement test scores are utilized in advising and placement in appropriate course work. Students with prior college-level work and those entering specified certificate programs may be waived from TSI requirements. The TSI Assessment test is administered at South Plains College and at other Texas colleges. Registration can be made online at www.southplainscollege.edu/testing. Certificate of Residence is part of the admission application. MENINGITIS: As required by Texas Law, all entering students under the age of 22 must provide proof that the meningitis vaccination was administered at least 10 days prior to the first day of the term. Proof must be received by the Admissions and Records Office before the student is allowed to register for classes. Meningitis vaccinations must have been received or renewed within the last five (5) years. For detailed information, go to www.southplainscollege.edu/admissions. RUBELLA: One dose of rubella vaccine administered on or after the first birthday. TETANUS/DIPHTHERIA: One dose of tetanus/diphtheria toxoid administered within the last 10 years. MEASLES: Two doses of measles vaccine administered on or after the first birthday and at least 30 days apart. MUMPS: One dose of mumps vaccine administered on or after the first birthday. More information can be obtained from the Student Health Coordinator or from the SPC website. An applicant who is a graduate of an accredited high school or who has successfully completed a nontraditional secondary educational program, including home school, will be admitted upon the presentation of a properly authenticated high school transcript. Successful completion of a non-traditional secondary educational program that meets all Texas Education Agency (TEA) standards and high school requirements. A notarized statement from the non-traditional high school, along with a notarized statement from the student verifying completion of the high school program must be submitted. Successful completion of the General Education Development (GED) test by an applicant who meets the age requirement for taking the GED test. provide documentation verifying the completion of high school diploma or equivalent when completed. The applicant’s TSI Assessment test scores will determine the student’s eligibility and course placement. General admission to the college does not guarantee admission to some technical education and health occupation programs, which have additional admission requirements. Please contact the appropriate program advisor for information. An applicant who enrolls in another college or university for only a summer term or session immediately following high school graduation will be admitted upon the basis of the high school record. Applicant will be admitted upon presentation of a properly authenticated high school transcript and an official transcript from the college attended. Transcripts must be sent directly to the Admissions and Records Office and must be on file prior to registration. A new student who has begun work at another accredited college or university and is not under disciplinary or academic suspension at the last college attended will be considered for admission to South Plains College. However, performance at the other institution must meet the minimum academic standards of the College. A student from another college seeking admission to South Plains College must submit an official transcript from each college previously attended. All official transcripts must be sent directly to the Admissions and Records Office and must be on file prior to registration. A student is not officially enrolled until all transcripts are on file. 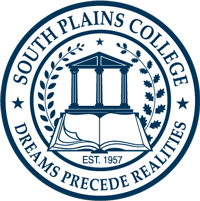 Former students of South Plains College who are not on suspension and have not attended another college since they were last enrolled at South Plains College, will be readmitted to South Plains College during any scheduled registration period. Former students who have attended another college or university since leaving South Plains College should refer to Methods of Admission 4. ​First-time, transfer and concurrent international students must submit the international student application. A $100 non-refundable application fee (in U.S. currency) is required before consideration of an application can be made. We accept cash, money order or credit card. If paying by credit card email the Business Office at INTLFEE@southplainscollege.edu. In the email please include your full name, name of credit card holder, credit card number, expiration date and the security code on the back of the card. Minimum score of a 550 (paper exam), 213 (computer exam), or 79 (internet-based exam). Scores are only valid for 2 years. Minimum score of a 6.5 for academic version, general training results are not acceptable. Scores are only valid for 2 years. Or by completing the highest level in an English as a Second Language (ESL) program. ​An official transcript from the last four (4) years of secondary school must be submitted. The official transcript must be an original copy translated into English and must show each course completed along with the grade earned. A minimum grade average of “B” is required. An unofficial copy of the transcript may be accepted temporarily for application to be reviewed. If accepted, student is required to submit the official transcript to the International Student Office upon arrival. Do not send transcripts, diplomas, certificates or any other academic credential that cannot be duplicated or replaced. All documents become the property of South Plains College and will not be returned to the student. ​Proof of financial ability to remain at South Plains College long enough to complete degree requirements must be submitted with the application. Proof can be in the form of a bank statement (minimum of $8,400 USD) and letter from the individual responsible for providing financial support for the international student, or the form I-134, Affidavit of Support. PROOF OF THE MENINGITIS VACCINATION, if needed. Official college transcript from all colleges/universities attended in the United States must be submitted in place of the high school/secondary transcript. Must have completed at least 12 semester hours semester hours with a minimum 2.0 GPA to be eligible for consideration. THE FORM I-20 WILL NOT BE ISSUED UNTIL ALL SPECIFIED REQUIREMENTS HAVE BEEN SATISFIED. Student must maintain a minimum of 12 credit hours during the fall and spring semesters. Only one (3hr) internet or distance education course will count towards full-time enrollment requirements, 9 hours in which must be taken on campus. If the student changes address, the student must provide the International Student Office with the new address within 10 days of relocating. Student may work on-campus, with ISO approval, up to 20 hours per week while school is in session and full-time while school is not in session or during the annual vacation. If the student acquires a Social Security card, the student is required to submit a copy of the card to the International Student Office immediately. Student may not work off-campus unless student receives an Employment Authorization Document from U.S Immigration and Customs Enforcement (ICE). If the student plans to leave the country for any reason, the student is required to bring in the Form I-20 to the International Student Office and have it endorsed. Failure to do so will result in the student not being eligible to return to the United States by ICE. If student legally changes their name. If student changes their major. If the student enrolls in another institution. If student intends to transfer. South Plains College reports to ICE all changes of name, address or major and changes from full to part-time course loads. Health insurance is not a regulatory requirement for F-1 students, but is strongly encouraged. South Plains College does not recommend any health insurance company. Before the student can apply for a visa to enter the United States as a student, the student is required to pay the $200 I-901 Student and Exchange Visitor Information System (SEVIS) fee. Most students may pay the fee by credit card at www.FMJFee.com. If the student’s country of citizenship or country of birth is Cameroon, Ghana, Nigeria or Gambia, the student will not be able to pay the fee by credit card. These students must pay by money order, Western Union Quick Pay, or certified check drawn on a U.S financial institution. Complete the Form I-901 online. A payment coupon will be generated upon completion of the form. Payment will be linked to your Form I-901 and your online payment confirmation will be available immediately. You will be able to go to your student visa appointment 2-3 days after your payment has posted. Once the student’s inspection is completed, the inspector will stamp the passport with an admission stamp and an electronic I-94 Form will be created. The Form I-94 serves as evidence of a lawful admission and “alien registration” that is required by law. If student enters by air or sea, student will be given a “tearsheet” that lists the www.cbp.gov/i94 website, where they can access their I-94 record and print a copy. Those traveling by land will have a paper Form I-94A created. The student is required to report to South Plains College by the registration deadline, and not more than 30 days after entering the U.S., to register for classes. Pursuant to SB 1107 enacted by the State of Texas, all entering students, under the age of 22, and enrolling at South Plains College, must provide proof that the meningitis vaccination was administered at least 10 days prior to the first day of the term. Vaccinations must have been received or renewed within the last 5 years. All new students entering Texas colleges are required to take the TSI Assessment prior to enrolling in college-level courses. We encourage students to register as early as possible for the test as space and testing dates are limited. Students will not be allowed to enroll in classes until they have taken the test. For test dates and information, please contact the Testing Center at testing@southplainscollege.edu or by visiting www.southplainscollege.edu/testing. Once student checks in with the International Student Office and takes the TSI exam, the student will be ready to register for classes. During registration, the student must meet with an advisor and plan their schedule of classes for the semester. Payment of tuition and fees is due at the time of registration. If student plans to live on-campus in student housing, the student is required to submit the housing application and $100 deposit, as early as possible. SPC housing is only available at the Levelland campus. For more information, contact the housing office at housing@southplainscollege.edu. The purpose of the International Student Club is to promote international and intercultural knowledge, understanding, and connectedness to SPC. c.) your completed and signed academic appeal form with supporting documentation relevant to your situation, an immediate contact telephone number, email address, and your declared major. Information about the appeals procedure and appeal form can be obtained from the Admissions and Records Office or online at www.southplainscollege.edu/admissions. The Dean of Admissions and Records chairs the Admissions Committee. Academic Fresh Start clears only your academic record. However, when deciding your eligibility for financial aid, the college must consider all prior college credits earned or attempted. For courses taken at South Plains College for which Academic Fresh Start is applied, the official transcript will continue to show all courses taken. Grades and grade points will be shown, however, the credit hours attempted and cumulative grade points will total zero for the Academic Fresh Start courses and will not be computed in the overall GPA. A notation will be placed on the transcript showing the semester which the student began to take courses after the Academic Fresh Start. Once approved and posted, an Academic Fresh Start may not be reversed. All requests for Academic Fresh Start must be made in writing by completing the Academic Fresh Start application. The completed application should be sent to the Dean of Admissions and Records prior to enrollment. A completed application for admission and ALL official college transcripts must be on file in the Admissions and Records Office. Admission requirements to these programs may be found in the program listing in this Catalog or on the SPC website. Contact the coordinator of the program in which enrollment is desired to obtain additional information. The early admission programs allow high school students to enroll in college courses while still in high school. The Dual Credit program allows a high school student to earn college credit while attending high school and to receive credit toward high school graduation. Such dual credit programs are part of a cooperative agreement between local accredited high schools and South Plains College. The Concurrent Enrollment program is available to public, private, and home schooled high school students. A concurrent enrollment student must be at least 16 years of age, and be classified as a junior or a senior. The Vice President for Academic Affairs may make an exception to this requirement. Must be classified as a high school student. Submit completed ApplyTexas application for admission at www.ApplyTexas.org. Submit an official high school transcript each academic school year. An official transcript must include the student’s academic record, which meets all Texas Education Agency (TEA) standards. Must be in compliance with all Texas Success Initiative (TSI) testing requirements. Submit completed Dual Credit and Concurrent Enrollment Approval form each college enrollment period. Proof of Meningitis Vaccination, if attending classes on any SPC campus. Upon acceptance by the South Plains College Dean of Admissions and Records, the student will be admitted under the conditional entrance policy and as a General Studies major until the student officially graduates from high school. While attending South Plains College, the student will be expected to adhere to all policies and procedures of the college. Major state and private colleges and universities in Texas have agreed to accept early admission credit hours from South Plains College. It is the student’s responsibility to verify other institutions’ requirements. Students participating in dual credit or concurrent enrollment courses should check with their respective high schools before enrolling in classes that may cause them to lose full-time-student status or their eligibility to participate in UIL contests if they withdraw from those classes. Students taking dual credit courses should still be eligible for such competition provided they meet all requirements for full-time high school attendance. For more information refer to UIL rules Sub-Chapter M, Section 400 of the constitution and contest rules. For more information about the Early Admission Programs at South Plains College, contact the Admissions and Records Office at admissions@southplainscollege.edu or the Continuing Education Office at rspears@southplainscollege.edu or jbatenhorst@southplainscollege.edu.